Marijuana use behind the wheel is growing nationwide. From 2007 to 2014, the number of nighttime weekend drivers in the U.S. with marijuana in their system rose nearly 50 percent, according to the National Highway Traffic Safety Administration (NHTSA). In light of this growing trend, enforcing impaired-driving laws is becoming increasingly complex. Early returns are in when it comes to fatal crashes in a state that has legalized the recreational use of marijuana. In Washington, which legalized the drug in 2012, the percentage of drivers in fatal crashes who recently used marijuana more than doubled—from 8 percent in 2013 to 17 percent in 2014—according to a study from the AAA Foundation for Traffic Safety. This means that one in six Washington drivers involved in fatal crashes tested positive for active THC (the marijuana ingredient that causes impairment). Some states, such as Washington, have created legal, or “per se,” limits, which specify that having reached or exceeded a certain concentration of active THC in one’s blood while driving is illegal in and of itself, regardless of whether or not the driver shows other signs of impairment, or is actually impaired. But AAA Foundation researchers concluded that unlike blood alcohol tests that can reliably identify drunk drivers, there is currently no scientific way to predict impairment due to marijuana based on a blood test result. Marijuana per se limits are arbitrary, raising concerns that some unsafe motorists might go free, while other drivers could be wrongfully convicted. Research on lab results of drivers arrested for impaired driving also underscores the challenges of identifying and prosecuting marijuana-impaired drivers. A driver’s active THC level may drop to below the legal threshold during the time needed to assess the driver and obtain a warrant to administer a blood test, which can take hours. Moreover, marijuana affects people differently, so developing consistent and fair guidelines is challenging. The Auto Club recommends more comprehensive enforcement measures in states where marijuana use is legal. 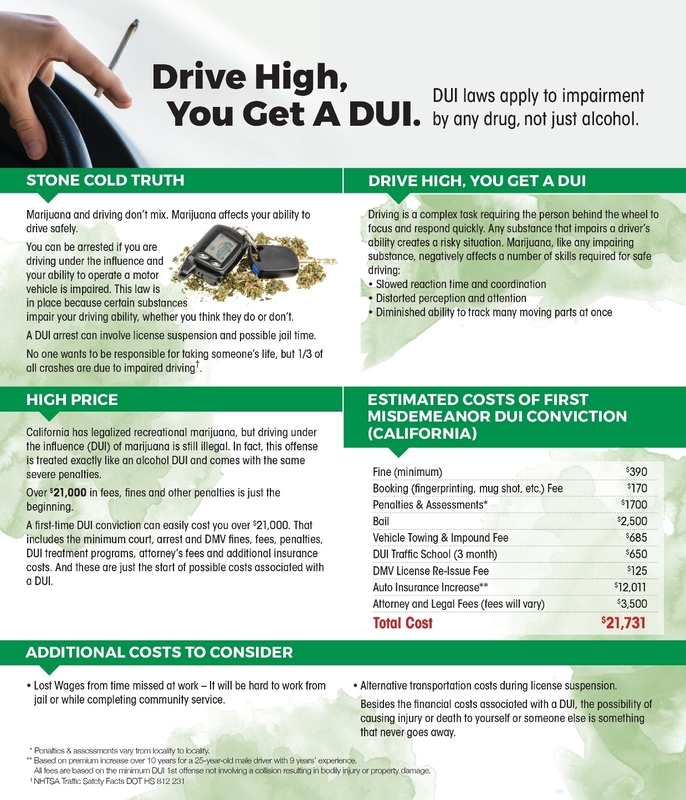 For example, to convict a person of marijuana-impaired driving, AAA suggests a two-step system that requires a positive test for recent marijuana use along with behavioral and physiological evidence of impaired driving obtained by law enforcement. Along those lines, an increasing number of police officers are training to become Drug Recognition Experts (DREs), part of a NHTSA-backed program run by the International Association of Chiefs of Police. While most law-enforcement officers can identify signs of alcohol impairment and conduct standard field sobriety tests, DREs also learn to recognize the objective signs of impairment from substances in any of seven categories of drugs not detectable by a Breathalyzer, including marijuana. “DREs should be called when officers encounter subjects who appear to be under the influence of drugs,” explains Jake Nelson, AAA’s director of Traffic Safety Advocacy and Research. In the high-stakes battle against impaired driving, DREs play a vital role. This article by freelance writer Kevin Adams originally appeared in the November 2016 issue of Westways.